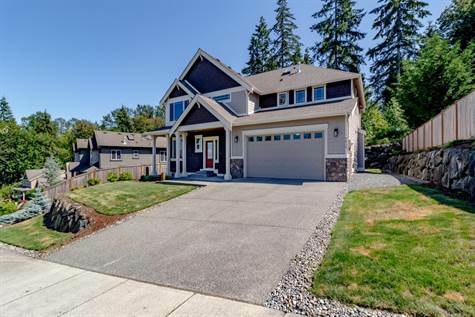 Stunning Craftsman style home located in the sought after neighborhood of Greenleaf. This beautiful open and bright home has mountain and valley views plus backs up to a greenbelt for privacy! The kitchen opens to the large family room and features Slab Granite counter-tops, Viking SS appliances, nook and large eating bar. Gorgeous Hardwood floors throughout the main floor and newer carpet upstairs. The master suite features a 5 piece bath W/walk-in closet. Other great features this home has to offer you are; large bedrooms, skylights, upstairs laundry room, Gas fireplace, neighborhood parks, secluded level backyard, covered porch, spacious garage with plenty of storage and top rated schools.